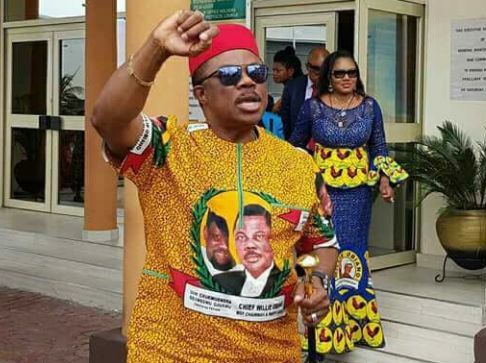 Anambra State Governor, Willie Obiano on Monday said he was no longer comfortable standing for the November 18 governorship election in the state. He said his life was in danger as far as the poll was concerned, stressing that his security details had been withdrawn. He said the action was ominous as it had exposed his life to eminent threat. Obiano stated this in Awka at an election stakeholders' meeting organized by INEC. He described the act as unacceptable and dangerous. The governor demands for the immediate return of his security details in order not to constitute further threats capable of overheating the polity, adding that he would fight back if nothing is done. "I want my security details returned immediately because I am going to start a fight from there. I am the governor of Anambra state and all the paraphernalia of my office must be there. "This is unacceptable and a sign of what will happen, those behind this would be disappointed because we are very ready for this election,." According to the governor, he had wanted to speak with the Inspector General of police who was scheduled to be on the occasion, but said he had to voice it out at the event since he was not aware when IGP would come. The governor had earlier complained of having not been accorded recognition by the moderator of the function when he walked in, despite several insistences. But reacting, INEC chairman, Prof. Mahmood Yakubu, said the event was a stakeholders' meeting, and as such no candidate would be accorded any special treatment regardless of his position. He said the commission insisted on equal treatment of all candidates in the election and should not only have equal standing, but must be respected equally. Speaking later, the Inspector General of police, Idris Mohammed, said the police decided to withdraw the policemen attached to politicians because of previous experiences where such cops worked for their “master".